This is an important day in our life together. We are all wondering about each other, wondering about what our future together will look like. So, as I prepared for this day, I hoped I would be led to a scripture passage that would speak to all the feelings that are part of this new beginning—hope and expectation, maybe some anxiety and some sense of loss, but also excitement and anticipation and, at least for me and I hope for you, joy in our being together. I am primarily a lectionary preacher, so each week I look first to the official list of readings which are recommended for Protestant churches. But this week, I was drawn to the passage in Luke about Jesus’ instructions to the seventy disciples whom he was sending out ahead of him into the places he himself intended to go. It seemed especially appropriate, since today we are all beginning a new journey together as Jesus’ disciples. The problem was, this story is very similar to one in Matthew’s Gospel: Jesus’ instructions to the twelve disciples whom he was sending out to proclaim the nearness of the kingdom. That was last week’s lectionary reading and, knowing that Pastor Del is also a lectionary preacher, I asked him if he had preached on that passage last Sunday. And, of course you know that he did. But as we talked, I realized that our approaches to the passage are very different, so I decided to go ahead with it. In fact, it points up something that I so love about Scripture: that it is a living thing, capable of speaking eternal truths to us in ways that meet us where we are at different points in our lives. So, just as you and Pastor Del looked to this story for guidance at the end of your ministry together, we can look to it for guidance at the beginning of ours. The stories told by Matthew and Luke have some differences. One difference is that in Luke, Jesus sends out seventy disciples, rather than just the inner circle of twelve. Another is that Mathew doesn’t tell us how Jesus sent them out—as a group of twelve, individually, in small groups? Matthew doesn’t tell us, but Luke does. Luke tells us that Jesus sent them out in pairs. Matthew tells us to whom Jesus sent the disciples—the lost sheep of Israel; Luke tells us where he sent them: every town and place where he himself intended to go, kind of like an advance team. Jesus gives his new messengers many instructions and cautions about their mission, and they are pretty similar in both gospels. But the instruction that especially caught my attention was this one, in the words of Luke: “Carry no purse, no bag, no sandals.” Matthew gives a few more details: “Take no gold, or silver, or copper in your belts, no bag for your journey, or two tunics, or sandals, or a staff.” In both accounts, Jesus tells the disciples to carry nothing with them when he sends them out. No purse, which means no money. No bag, as in no food or supplies. No sandals, as in no extra equipment, no change of clothing or protective gear. They were to travel with no belongings in their hands. The idea of travelling with no purse or bag or sandals may have been an easier concept for those 1st-century folks than for us. Most people then (including Jesus’ followers) didn’t have much in the way of extra clothing, extra food, or extra money, and travelling on foot would have limited what they could carry anyway. But still, can’t you just hear those newly commissioned disciples questioning the wisdom of Jesus’ advice? Can’t you hear them saying, “Nothing, Jesus? Are you serious? We are to carry no supplies at all? Nothing to ensure our comfort or well-being? Nothing to make us feel safe?” But, yes, Jesus did tell his disciples to travel light. That is certainly not a concept most of us practice. Do you go anywhere, even just down the street, without stuff in your hands, purse, or pockets? I certainly don’t! When I go back and forth from church, I carry a lot of stuff with me. Each day, when I leave the house, I load up my car with my purse and my travel coffee mug and my lunch bag, my computer and my Bible and my briefcase full of files and paperwork, along with the blue plastic crate full of the books I brought with me for the work I would do at home. In the future, you might see me bringing my running clothes and shoes, as I check out the places to run and walk in Whitehouse. At the end of the day, I load it all back up again. I do not travel light as I commute between home and church. I haven’t gotten all moved into my office here, yet. But I have boxes full of books and keepsakes and toys for children who might come to visit me, and some odd and ends that I just might need someday. I am not travelling light as I get settled in here at Zion, either! My husband Marc and I like to travel, and I can tell you that most of the airplane passengers I see do not arrive with no purse, no bag, or no sandals. The passengers are loaded down with carry-on luggage and containers of food and beverages and electronic devices. Parents of small children have strollers and car seats, toys and snacks, diapers and bottles. If you are planning a summer vacation, maybe you are planning what all you will need to take with you, and wondering how you can cram all the stuff you’ll need into your suitcase or the trunk of your car or your RV. Even young children carry around a lot. A few years ago, Consumer Reports learned that most 6th graders were carrying about 18 1/2 pounds of stuff in their backpacks, with some carrying up to 30 pounds! Few of us, even our children, travel light, whether we’re going across the street or around the world. Why do we need to carry so much stuff? Thomas Hine is a cultural historian, and he suggests that we have lost our sense of what he calls “shared stability.” In what he calls this “Age of Insecurity,” we worry about our jobs, families, country, and identities. We’re afraid for our children’s well-being in an unpredictable world. We feel threatened. Sometimes, we feel like we’re on our own in a world that is out of control. So, Hine says, we carry stuff with us. Just in case something happens. That way, we think, if we are caught off-guard in a new or unfamiliar or frightening situation, we will be prepared with everything we need and can rely on ourselves. We won’t have to depend on anyone else, because we don’t think we can. We fill our hands and pockets and bags with things that will keep us safe and keep our loved ones safe. My daughter Peyton is thirty-one and married, but she lives near Washington D.C. and works not far from where the baseball practice shootings happened. You can bet that, when I hear of violence in the world’s capital cities, I wish I could make sure she carried with her every safety device she could possibly need to be safe. We take comfort in the physical things we carry with us. But, sometimes the things we carry—the things we cling most tightly to—are not physical possessions at all. Sometimes they are things like relationships, careers, lifestyle, attitudes, traditions, and beliefs. These, too, help to define who we are. These, too, can make us feel safe and secure in a world we can’t control. But Jesus knew the problems that carrying stuff—either tangible or intangible—can cause. He knew that when our hands or hearts are clutched tightly around what is ours, it limits what we can do. It limits how we connect with others. And, if we place too much trust in the things we carry, it limits the trust we place in God. When we are carrying things with us and our hands are full, we aren’t able to use them for other tasks—kingdom-building tasks. We can’t help someone by carrying one of their burdens for a while. We can’t shake hands with someone new. We can’t put our arms around someone who is hurting, push a wheelchair, or a pick up a child. Sometimes we can’t even fold them in prayer. When our hands and hearts are full, we are also prevented from receiving what is offered by others. It is impossible to accept a gift when our hands and hearts are clenched tightly around the things we carry. The things we carry close us off from the opportunity to take hold of something new—to explore it from all angles and appreciate its beauty. 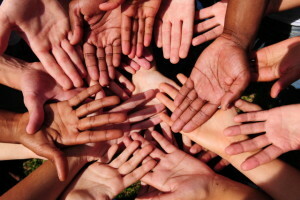 They cut us off from taking a hand that is extended to us in love and encouragement and support and welcome. When we hold on to what we think is valuable—whether it is something physical like money and other belongings, or intangible, like power or position or traditions or ideas, we are always worrying about losing them or having them stolen away from us. Keeping track of what we are holding demands our full attention, to the exclusion of the beauty and opportunity around us. We’re always on the look-out, eyeing the people around us suspiciously. We look at others as potential threats rather than potential friends, people more likely to steal our physical belongings than to steal our hearts, more likely to take away our place in our community than to make us stronger, more likely to undermine the traditions and ideas we cherish than to help us grow in them. We are distracted from the mission Jesus sends us on as we place our trust in the things we hold so tightly. But, over and over in Scripture, believers are invited and reminded and even commanded to put all our trust in God, not in what’s in their hands. In our baptismal service, we are asked the question, “Do you confess Jesus Christ as your Savior, and put your whole trust in his grace?” But, the things we carry may prevent us from fully trusting in God and in his Son, Jesus Christ. They may lull us into thinking that we can rely on ourselves as make our way in the world. Relying on our possessions gives us a false sense of security that can encourage us to forget to rely on God and to trust God to provide what we truly need. I know something about how hands and hearts that are full of things that make you feel secure make it difficult to undertake the ministry God calls us to. In 2008, my life was full of wonderful things. Peyton was doing well in a good job and a loving relationship with Christopher, the fine young man who has been her husband for almost six years. For Marc and me, the transition back to being “just a couple” had been joyful and satisfying. Although my mother was already in the very late stages of Alzheimer’s, her condition was stable, and she was getting excellent care from the staff at Sunset Village, where she lived until the day she died three years ago. I had interesting and challenging work to do in my part-time jobs, one with my husband’s law practice and one as a math tutor at the Polly Fox Academy—a high school for pregnant and parenting girls. I had opportunities to offer meaningful service at my church. My days were orderly, predictable, satisfying, and pretty much entirely under my own control—and I liked it that way! And then I heard my call to ministry. At first I couldn’t believe God was calling me. But as it became clearer that that truly was the case, I have to say I was more dismayed than joyful. Because I knew that to accept that call would mean giving up what had been filling my days, making me feel secure in the world, and forming my identity. I knew that accepting my call would mean leaving home to go to seminary, spending time away from my husband, and seeing my mother less often. It would mean leaving my friends and entering a world of strangers and new ideas. It would mean spending a good portion of our savings on graduate school at a time when most of my friends were starting to think about retirement. It would mean giving up my work as a tutor, and it would change the role I played at my church. And I knew that, eventually, accepting my call would mean leaving the church family that had nurtured me for nearly 29 years. I knew that to go where Christ was sending me, I would have to let go of many of the things I carried. I would have to rely on God’s grace and guiding hand to help me carry out this commission I believed I had been given—to go in a new way where Jesus intends to go, carrying no purse, no bag, and no sandals. Jesus’ instructions to his disciples seem to put limits on us and on our lives—rules that restrict what can have and do. But, actually, Jesus’ instructions free us. They free us from the things that hang onto us, while we are trying to hang onto them. Without the burden of the stuff we carry, we are freed to do the work Jesus commissions us to do: “Eat what is set before you, cure the sick who are there, and say to them, ‘The kingdom of God has come near to you.’” When we no longer depend on what we carry with us, we are free to accept what others offer us, and as a result, we are free to heal and to witness. Our open hands, like the disciples’, mark our freedom to carry out our mission, but they are also a daily reminder that we are completely dependent on God’s providing for us. And we learn that when we begin to rely on God’s grace, we can be successful in carrying out the mission Jesus gives us. The disciples, sent out with no purse, no bag, and no sandals—nothing but faithfulness to their mission of healing the broken and sharing the good news of God’s kingdom—these disciples returned with joy, reporting that even the demons had submitted to them. When, by God’s grace, I was able to stop relying on the things I clung so tightly to and instead to rely on God’s goodness, doors began to open—to scholarship money, to a new community at seminary, to an even deeper relationship with my husband, to new ministry opportunities, and even to becoming a pastor to the very church family I had been reluctant to let go of. And more importantly, I found a deep sense of joy that was unlike any I had ever experienced before. Jesus challenges us to leave behind the things that give us comfort as we venture out to heal a broken world and to proclaim the presence of God’s kingdom. But, although Jesus sends us out open-handed, he does not send us out empty-handed. We go with our trust in God and with a passion to share the good news. He sends us out with a message of love and hope and peace that has endured for 2000 years and which continues to speak to the world today. And he doesn’t send us out alone. Like the seventy, whom he sent out two by two, he sends us together, as his Body, as his family, as his Church. Our open hands not only allow us to reach out to those in our community, but they also allow us to take each other’s hands, for consolation, for companionship, for encouragement, and for shared ministry to a broken world that longs to hear the good news of Jesus Christ. I have been so excited to hear of how you are already reaching out to and welcoming this community, through TAP and the Food Pantry, the pre-school, and even the driving school. You have already extended your open hands to me—you have shaken my hand, given me hugs, and “friended” me on Facebook. You’ve invited me to the Food Pantry potluck at the home of Pat and Howard, where their dog Leo welcomed me with an open paw! Louella gave me a bouquet of flowers, picked from her own garden. Your hands are open but not empty. My hands are open as well, and they are not empty either. With them I offer you my love of God, my passion for growing in our faith in Jesus, and my desire to serve God and all God’s people in this place and beyond these walls together with you. May we venture out together on the mission Jesus has set before us, burdened by no purse, no bag, and no sandals, but with our open hands joined together by our trust in God and our love for Christ. Amen.